Exits, by Daryl Seitchik. Toronto, Canada: Koyama Press, September 2016. 220 pages. $15.00, paper. When I first heard about Daryl Seitchik’s comic Exits, the story of a woman who works at a mirror store until she achieves (or is cursed with) full invisibility, I felt confident I knew where the story would go. I figured Claire, the now invisible protagonist, would have enjoy her new freedom but then grow tired of isolating and resent her disappearance. I also figured Seitchik would try to explain how and why Claire disappeared and how it makes sense within the comic-world. Even though I picked up Exits with entirely too much confidence in my predictive powers, I was still eager to read it. My first impression of Seitchik’s aesthetic led me to believe she would handle alienation and depression with respect in Exits, and after personally living with depression, I needed more books like that in my life. Seitchik manages to be both detailed-oriented and efficient in the opening pages of Exits. In the above strip, Claire is just barely putting up with her misogynistic boss at the mirror store. The mirror store boss is not given a nose but he does have a limp collar, a douchey employee star chart in the background, and Alfalfa hair. I hate this boss within a single panel. Claire is a brick wall in her panel despite reclining passively on a beanbag. Her black hair, black outfit, folded arms, and the plainness of the beanbag ensure Claire is impenetrable. The only exception, of course, is the interwoven lines above her head that manage to singularly convey her frustration and disappointment. The true joy of reading Exits is watching Seitchik fuse multiple unsettling details into one, clear image of neurosis. In the above frame, Claire dreams she is the replacement pilot on a doomed plane. The chaos of the situation is marked with the jarring erasure of a second “fellow passengers” word bubble and the erased backs of at least three chairs. Also effective in this panel are the ominous glares of not one but five Claires via a surreal visual projection that probably interrupted someone’s viewing of State of Play (2009). Claire is pantless as she addresses the passengers, and also shoeless. She is literally using her left hand pinky and thumb as a radio. Every detail in this panel creates an effective dream sequence that familiarizes us with Claire’s growing instability. In this strip, Claire breaks the news to her mom that she has quit her job at the mirror store. What she leaves out, of course, is the fact that she is invisible. In her mom’s panel we see a half-empty bottle of wine, a glimpse of her partner Bradley, an endearingly bootleg Apple laptop, even the magazine she was reading before picking up the phone to call her daughter. Her personality and her mental state entering the conversation are firmly established. Meanwhile, Claire’s panel is giving us very little to work with. Because Claire is invisible, her furniture is invisible as well (that’s the rules, apparently). Obviously, she is upset that her mom let Bradley know about her unemployment, but is she also upset at the prospect of telling her mom about her (maybe permanent) invisibility? Why does the now-invisible Claire even pick up the phone and to what extent does she regret her decision? No visual tricks are employed to give us these emotional cues. In this panel, Claire manages to kick us out of her head. Seitchik, as I originally suspected, does some work to explain how invisibility is a larger phenomenon within the comic’s world. However, as effective as panels such as the one above are, they come too late in the story and feel too rushed to really resonate. The panel above is rich with well-managed exposition such as the haunting photograph at middle-right that is supposed to assure us “invisible people can still lead normal happy lives”. 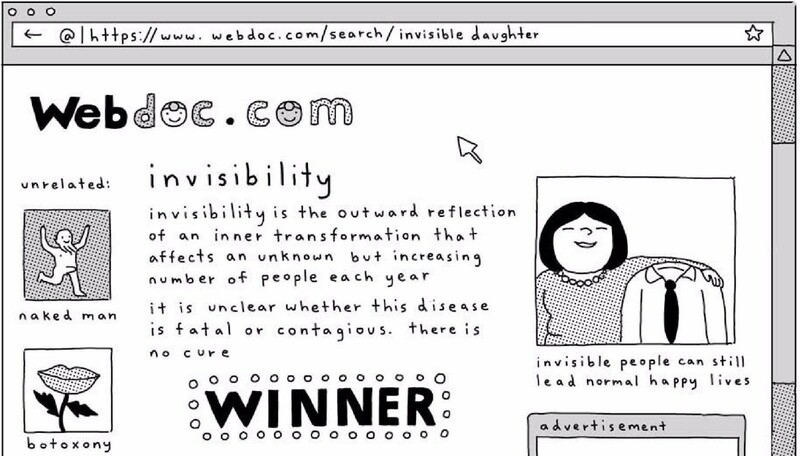 The best detail in the panel is a direct commentary on Claire’s personality: according to the url code at the top of the page, she put “invisible daughter” into the search bar of Webdoc.com in order to learn more about her condition. The real treat of reading Exits, then, is delving into Claire’s sense of humor, psychosis, and assertive beanbag posture. Seitchik’s attempts to widen the universe and even to flesh out Claire’s relationships with others do not feel disingenuous or even poorly written as much as they feel distracting to our much-desired plunge into Claire’s core. For those of you, like me, who live with depression and need to experience more art that understands the struggle: Exits understands the struggle and offers our people a protagonist we can be proud of. But for everyone else, there are still many things to look forward to in Exits, including but not limited to: Apple knock-offs, ubiquitous “naked man” news headlines, and, my personal favorite, invisible radios for ambitious, pantless pilots.